The fate of the property at 5565 state Route 37, Delaware, along U.S. Route 36/state Route 37 will be decided Tuesday, May 8, as Berlin Township voters face a referendum on the ballot as to whether or not to overturn a zoning decision made by Berlin Township trustees in October. Savko Brothers Properties has offered the house on the property, pictured, to the Berlin Township Fire Department for the purposes of training. According to Capt. Mark Carey, the use of the building could save the taxpayers of the township $400 to $600 per firefighter, the cost of sending firefighters to academies to do the same training. Berlin Township Fire Department officials said the biggest problem with the U.S. Route 36/state Route 37 corridor is insufficient water pressure from the hydrants. The Berlin Township Board of Trustees approved a measure in October 2017 involving the rezoning of 24 acres of land, 5565 state Route 37, Delaware, along U.S. Route 36/state Route 37 from Farm Residential to Planned Industrial. The decision only left residents with one alternative when they felt their concerns weren’t being addressed, petition for a referendum to be placed on the May ballot. This Tuesday, May 8, Berlin Township voters will face the referendum, which gives them the chance to decide whether or not to overturn the trustees’ decision to rezone the property. However, as part of the industrial park/concrete plant proposal, Savko Brothers Properties has promised to set aside 2.4 acres of the property for a future Del-Co Water tower. Carey said when the RV dealership on U.S. 36/state Route 37 caught fire in 2014, all of the water had to be trucked to the site of the fire. He said the township’s fire department called in other departments outside of the county to help truck water to the fire. When the American Legion caught fire, again the water had to be trucked in to fight the fire. “Because of the size of the buildings, we needed a ton of water,” he said. Carey said with a water tower, the hydrants will be supplied with the water the department needs. However, the tower is in the future and will not go in at the time the industrial park is constructed. Both Hall and Carey were scouting the property of the proposed industrial park/concrete plant Monday for future training exercises. 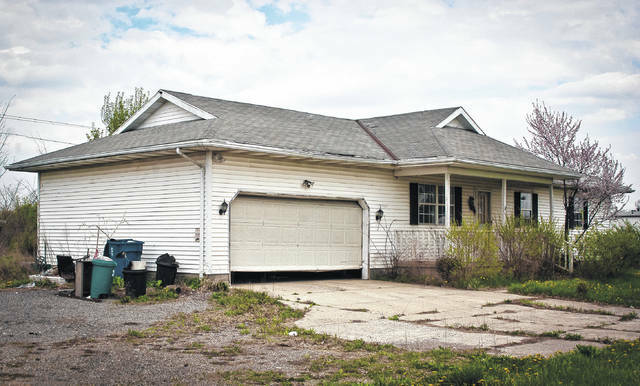 Savko has offered the house in front of the property to the township’s fire department to be used for training purposes. Hall said the department isn’t going to burn the house because it is to close to 36/37. He said once the department is done with the building, Savko will come in and tear it down. Hall added it’s also a huge savings to neighboring departments that will be invited to train alongside Berlin Township. Both Hall and Carey said they didn’t see a downside to the proposed industrial park/concrete plant. https://www.delgazette.com/wp-content/uploads/sites/40/2018/05/web1_DSC_1381.jpgThe fate of the property at 5565 state Route 37, Delaware, along U.S. Route 36/state Route 37 will be decided Tuesday, May 8, as Berlin Township voters face a referendum on the ballot as to whether or not to overturn a zoning decision made by Berlin Township trustees in October. Savko Brothers Properties has offered the house on the property, pictured, to the Berlin Township Fire Department for the purposes of training. According to Capt. Mark Carey, the use of the building could save the taxpayers of the township $400 to $600 per firefighter, the cost of sending firefighters to academies to do the same training. This entry was tagged concrete plant, Craig Hall, D. Anthony Botkin, Mark Carey, Michael Shade, Savko Brothers. Bookmark the permalink.